Innovative Assembly Design's reputation for responsive customer service and extensive product support is unequaled in the industry. 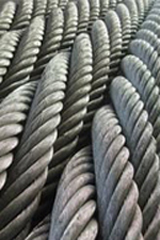 With a highly experienced and knowledgeable management team, Innovative has developed rapidly and become one of the major importers and distributors of the world's finest wire rope, aircraft cable, chain, hardware, and fittings. Representing many of the United States' and the world's finest manufacturers, all of the products provided by Innovative Assembly Design are certified to meet or exceed the applicable federal, military and industry specifications. Our goal is to assure top quality products at the world's most competitive prices. Innovative Assembly Design is building its business on the concept that our customers are our family. Each member is looked after with the same attention to detail and service that has made Innovative the place to go for all you wire rope, cable. chain, and industrial needs. We strive to be the best in what we do and invite you to try us and become part of the Innovtive Assembly Design family.